US Navy Photo, ca. 1952. From the AE 19 cruise book 1952. USS DIAMOND HEAD was a MOUNT HOOD class ammunition ship and the first ship in the Navy named after the extinct volcano on the island of Oahu, Hawaii. Laid down as maritime commission C-2 hull, she was acquired by the Navy on March 10, 1945. Subsequently converted to an ammunition ship at Bethlehem Steel, Baltimore, Md., the DIAMOND HEAD was commissioned on August 9, 1945. Decommissioned after one year of service, the ship was laid up for five years until recommissioned on August 9, 1951. DIAMOND HEAD made several Mediterranean cruises and also served off Vietnam in 1967 and 1968. Both decommissioned and stricken from the Navy list on March 1, 1973, the DIAMOND HEAD was sold for scrapping on October 3, 1974. Builder: North Carolina Shipbuilding Co., Wilmington, N.C. This section contains the names of sailors who served aboard USS DIAMOND HEAD. It is no official listing but contains the names of sailors who submitted their information. 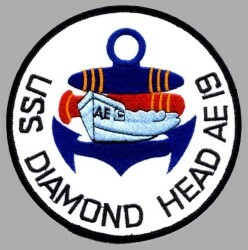 Click here to see which USS DIAMOND HEAD memorabilia are currently for sale on ebay. April 27, 1961 Caribbean Sea USS INDEPENDENCE (CVA 62) collides with USS DIAMOND HEAD. INDY is not damaged but two departments of the DIAMOND HEAD suffer leaks and she's holed above the waterline.